Cellular remodeling of their neighboring environment, extracellular matrix (ECM), is an important biological process from development biology, to wound healing, to diseases and cancers – this is a challenging process to measure and quantify. Surface plasmon resonance imaging (SPRI) has been developed as a quantitative, label-free microscopy to image real time observation of live cell engagement with the surface, and protein deposition and remodeling. 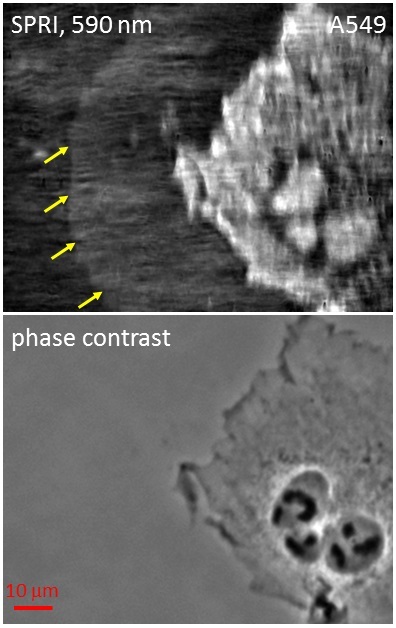 The SPRI technique is an alternative to the commonly used fluorescence microscopy for examining cell-matrix interactions. This technique removes the requirement for modified biological molecules and transfected cells. 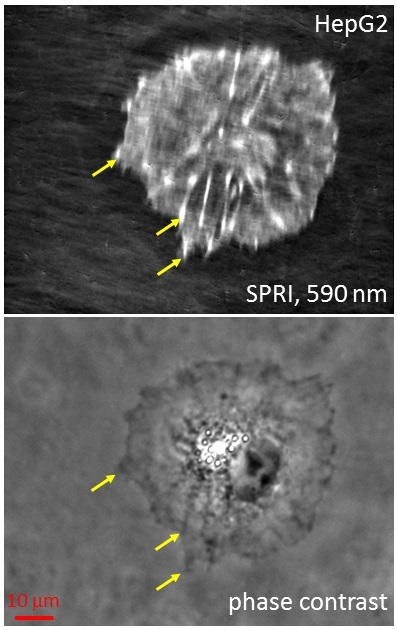 Researchers here have improved upon the spatial resolution of SPRI enabling the ability to visualize subcellular structures near the sensor surface. Along with quantitative interpretation of the images, essentially refractive index measurements, dry mass values of subcellular components can now be measured. For example, a smooth muscle cell has been measured to have focal adhesion dry mass of 980 ng/cm2 and can deposit up to 120 ng/cm2 of protein around it’s periphery under normal growth condition. Measurement of ECM, protein deposition, and cell phenotype with SPRI. Quantification of cell areas, dynamic changes in cell-substrate, and changes in surface protein density over time. Research here is underway to develop SPRI as an imaging biosensor that can visualize dry mass changes down to a single bacterium that is part of a bacterial biofilm. Measuring antibiotic drug response at an individual cell level in addition to the biofilm as a whole can provide insight and understanding of how biofilms contribute to antibiotic drug resistance. NIST has submitted a patent for this technology and is looking for collaborations with industry to commercialize this measurement technique.